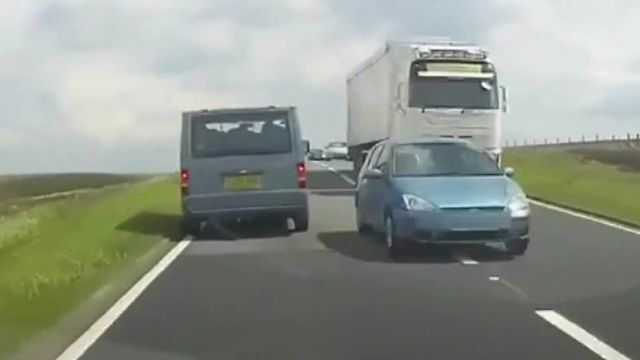 Whilst we wait for perfect driving scores and the onslaught of driverless cars, we have many years to endure the human element of driving, or as you will see from this footage, some pretty awful examples of how not to drive. Sadly, we are not often able to prove one way or the other with a 'it's my word vs yours' approach! DashCams for me are where SatNav devices were about 6-8 years ago, the add on you purchased, that could soon be standard issue. Now relatively inexpensive, from £25 - £250+ each, easy to fit - many insurers are asking if you have one or not, or are giving them away with the hope that by using them they can provide evidence in the event of a incident or crash. For me, I see a sharp rise in these to help provide insights and video to the authorities (as in this case) and insurance firms be it bad driving, road rage or more. Of course it doesn't work for all countries, some have privacy laws that prohibit this, whereas other countries they are practically a default now. However, what I find interesting and reassuring in this case is the use by the police to identify cases where action should have been taken. The UK already has more cameras than any other nation; almost 6 million CCTV. This will only fuel the existing label we have as having the most amount of cameras per person, but shows no sign of slowing down. There are so many other great examples - hard to really believe some of them - but this is a whole new category that didn't exist a few years ago. Other devices such as that from Nauto, which recently raised over $159m from a whole series of automotive manufacturers including GM, BMW & Toyota as well as Allianz, Greylock and Softbank. This looks both outside and inside the car to specifically to pick up on distracted driving, something that is claimed to cause 68% of accidents. Again plenty of great examples online like this here of a driver watching football at the wheel, that's definitely distracted! Something both the phone manufacturers and other startups are trying to address. Apple for example in their latest release will have a setting (you have to enable it manually once, then it's on for good) that puts your phone into 'Do Not Disturb mode' when driving and sends your contact a message to say the same whilst disabling the alerts. This really works, I have been using it for a while (although it doesn't yet distinguish between a road/car and a train), as well as other companies such as Katasi are also doing something similar with an add-on. Ultimately, if it makes the roads safer, reduces my motor premium (see here for examples) it surely can't be a bad thing. However, not everyone agrees. The AA said back in May, that folks who share too much could be accused of Voyeurism. Whilst I have touched on fraud prevention briefly, we must also be cognisant of fraud used in the other ways too, i.e. there are plenty of examples where photos have been doctored or changed, criminal gangs often being one step ahead. How soon before they become professional video editors? As the old saying goes: if a tree falls in the woods, and no one is about.. does it make a noise? Now more than ever before, there is someone watching that might just help you. I don't see this category slowing down anytime soon. Right, time to go choose a dashcam! All four police forces in Wales are to start using dashcam footage recorded by the public to investigate driving offences following a successful pilot scheme by North Wales Police. Operation Snap started last October in north Wales, encouraging drivers to upload evidence to the police website. So far, the force has dealt with 129 cases as a result of footage submitted. The operation will link up with the Go Safe partnership to operate across Wales.